Prior to my recent to trip to Blowing Rock and Boone, I perused John Batchelor's book Chefs of the Mountains (I actually saw it for sale in a store up there!) and was instantly sold on Boone favorite Vidalia. Being that it was a Saturday night, on MLK weekend, the chances of getting a table looked pretty slim. Luckily, the waiting list opened up and we got a table - at 5:45pm! That was just fine with my sweetie and me - we had spent the afternoon walking around, working up an appetite, and dropping by the new Appalachian Mountain Brewery (note - they don't open until 3pm, so you're in good company at 2:59 in the parking lot!). 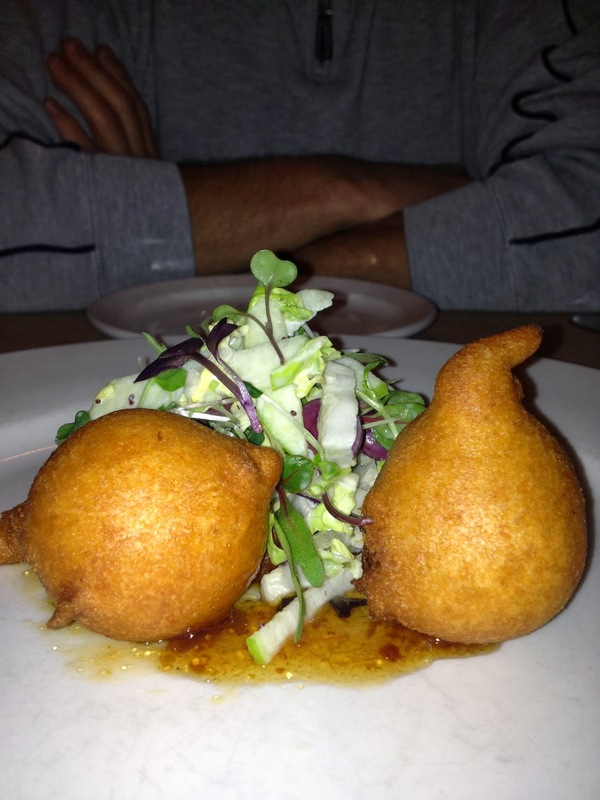 My eyes got wide when I read Vidalia's featured appetizer of the evening: Foie Gras Pate Hushpuppies. That's right - fried balls of Foie. (Try saying that 5 times fast.) Look down all you want, but us Southerners love Hushpuppies, and THIS Southerner loves Foie in any form. (Foie Gras is the fattened liver of a goose, and is rather sad when you think about it, so don't.) The crispy batter was sweet, the texture inside smooth and buttery. This is a bite of absolute heaven. It's one of those moments where you're shocked food can really be that good. I opted for a Deconstructed Chicken Pot Pie, because it featured some of my favorite words (Sweet Potato, Gnocchi, Parmesan). 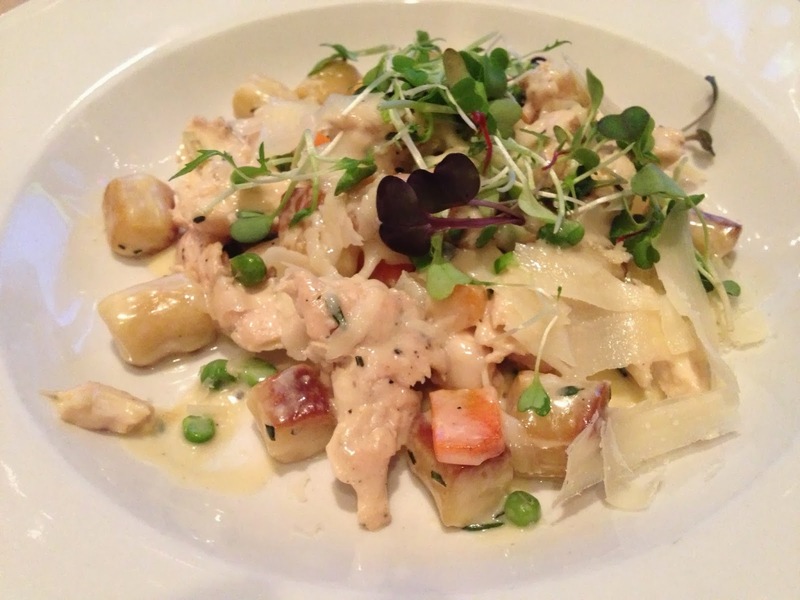 Tender Chicken bites and Sweet Potato Gnocchi Dumplings are married together in a White Wine Sauce, with Peas, Carrots and Celery providing nice texture and color. The sauce is indulgent and creamy, and shreds of Parmesan take it to perfection. I loved this rendition of a classic. 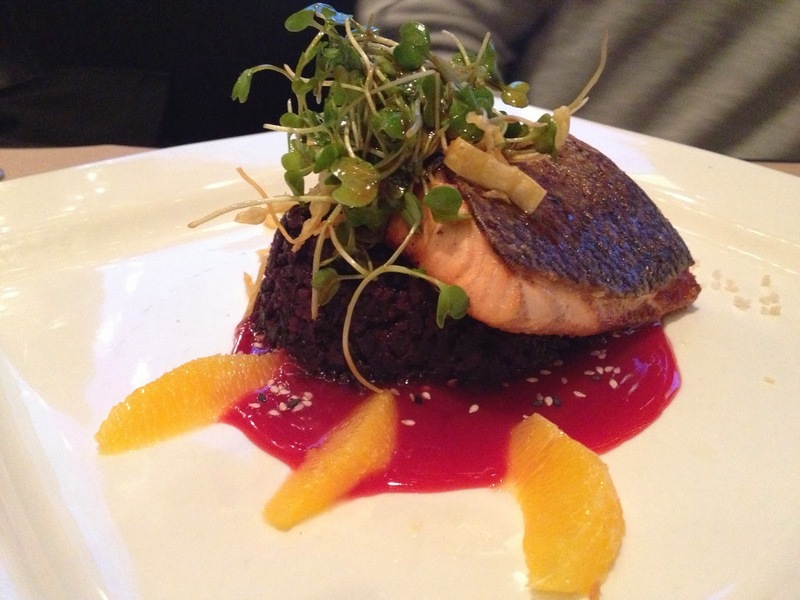 My sweetie's ears perked up upon hearing the entree special - Salmon with Black Rice and a Blood Orange Gastrique. For a non-Salmon fan (I know, I know, call me crazy) it was was tender and not too fishy, and paired with the al dente Black Rice, it was a really great bite. I was surprised at the sweetness of the Blood Orange Gastrique, hoping for a bit more of the bitter acidity you find with the fruit, instead of the addition of sugar. It seems all of Vidalia's dishes are topped with Microgreens (all three of ours were), but that didn't bother me - who doesn't love an edible, healthy (not to mention cute) garnish? If you find yourself in Boone, you should also check out the Come Back Shack. Burger aficionados (you know who you are), college students and anyone looking to indulge in that perfect trifecta of flavors - fries, ketchup, milkshake - you'll love this spot. Intriguing toppings range from Pineapple to their awesome Come Back Sauce, and the Oreo milkshake will have you practically eating the straw. Shout out to my aunt and uncle for hosting us and feeding us more Margs than I could have possibly dreamed of. It was a fabulous weekend. I especially like the first picture....accented with brown forearms in the background. Strong, defined brown forearms.